Get your protein fix, satisfy your sweet tooth, and dig into the flavors of a piping hot apple pie without the unwanted calories! It may be summer, but the warming flavors of apple pie never go out of season. That sweet, nutty scent of a lattice-enclosed pastry filled with apples coated in a cinnamon sugar glaze—delicious! But taste and health don't always go hand-in-hand. Luckily, my apple pie protein cupcakes are the exception. They're moist, delicious, and pack a protein punch! These cupcakes lack the fattening ingredients you'd find in traditional baked goods such as butter, table sugar, and refined flour. Instead, these sweet treats contain healthier alternatives that don't compromise the flavor and texture we all know and love. What's my secret ingredient, you ask? Coconut! Who knew you could do so much with the humble coconut tree? 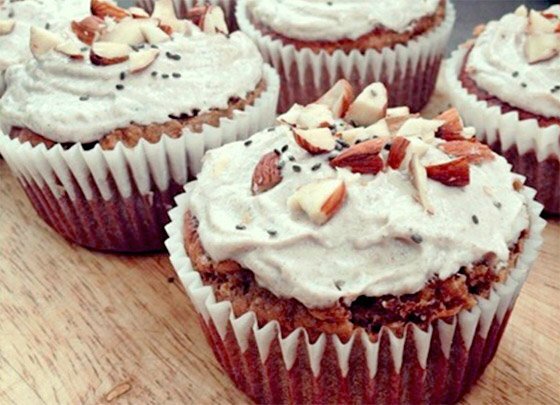 It has been used to produce a range of healthy baking ingredients including coconut oil and coconut sugar, both of which are featured in this recipe. Coconut sugar is a sweetener made from the sap of coconut palm tree blossoms. It has a delicious rich caramel flavor and contains micronutrients like zinc, calcium, and magnesium. It also has a low glycemic index, which helps reduce large fluctuations in blood sugar and the resulting release of insulin. Coconut oil has been hailed as a superfood due to its ability to improve brain function, increase immunity, and fight disease. It is a great source of fast-releasing energy and it fills you up longer. Plus, coconut oil tastes absolutely delicious. Trust me, I can eat it straight out of the jar! These cupcakes each boast 16 grams of high-quality protein and are made using Optimum Nutrition's Gold Standard whey and casein. They make a perfect post-workout treat, quick breakfast option, or an easy on-the-go snack. So get out that mixing bowl, put on your apron, and get cooking. With these treats, you can have your cupcakes and eat them, too!